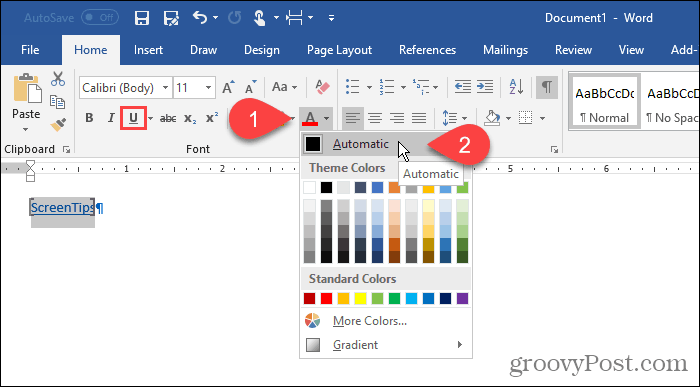 ScreenTips in Word provide quick help for commands on the ribbon and you can create your own custom ScreenTips in your documents. We’ll show you how. 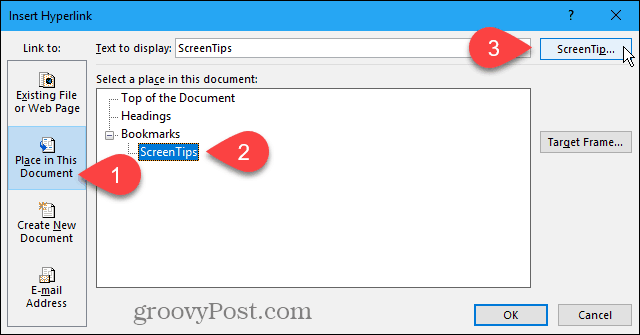 Word displays small popup windows called ScreenTips when you move your mouse over a button, or command, on the ribbon. ScreenTips provide short descriptions indicating what the button does and can also display the shortcut key for that command. You can control the amount of detail shown on ScreenTips and disable them if you don’t want to see them. 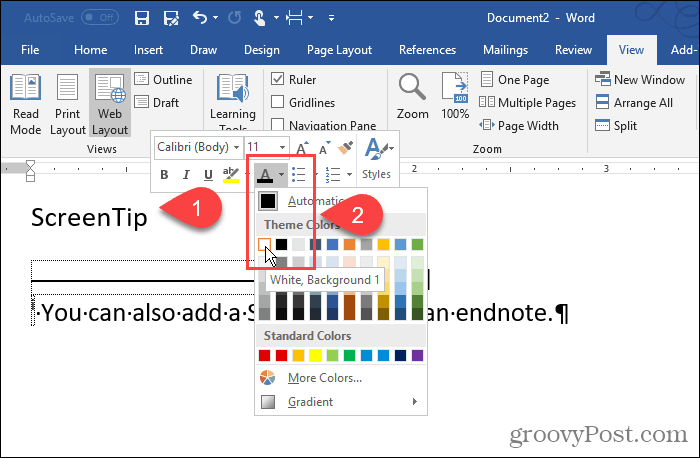 You can also create your own custom ScreenTips on content in your document to display helpful information about text or images. Today we’ll show you how to enable and disable ScreenTips, show enhanced ScreenTIps, show or hide shortcut keys in ScreenTips, and a couple ways to create your own custom ScreenTips. The built-in ScreenTips that display for buttons on the ribbon are enabled and are enhanced (show feature descriptions) by default. But you can adjust what the ScreenTips display or disable them completely. 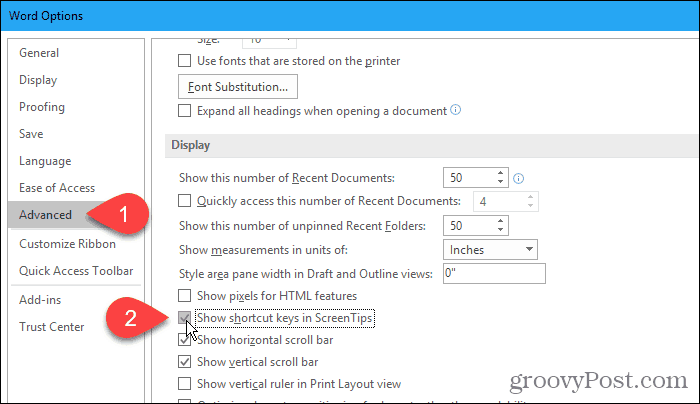 To adjust the style of the ScreenTips, go to File > Options and make sure General is selected in the right pane. 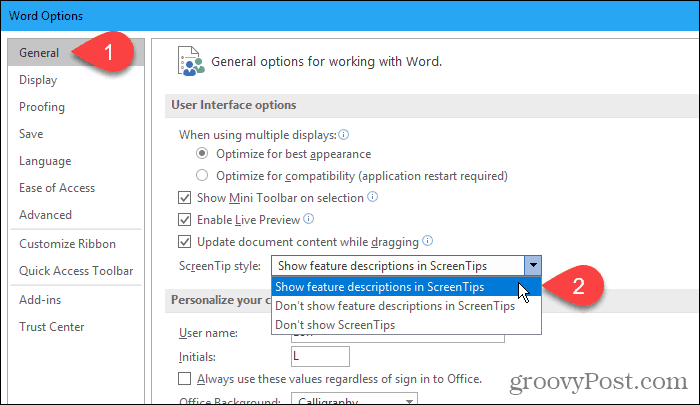 The Show Feature Descriptions in ScreenTips is selected in the ScreenTip style drop-down list by default and shows enhanced ScreenTips with descriptions of what each button does. To show ScreenTips without the feature descriptions, select Don’t show feature descriptions in ScreenTips. To disable ScreenTips completely, select Don’t show ScreenTips. These settings do not affect any custom ScreenTips you create on text or images in your document. If you like using keyboard shortcuts, but tend to forget them, you can use the built-in ScreenTips to view the keyboard shortcuts for the buttons on the ribbon. Or, if you don’t want to see the keyboard shortcuts, you can hide them. By default, Word shows keyboard shortcuts in the ScreenTips on the ribbon. To hide the shortcuts, go to File > Options and click Advanced in the right pane on the Word Options dialog box. 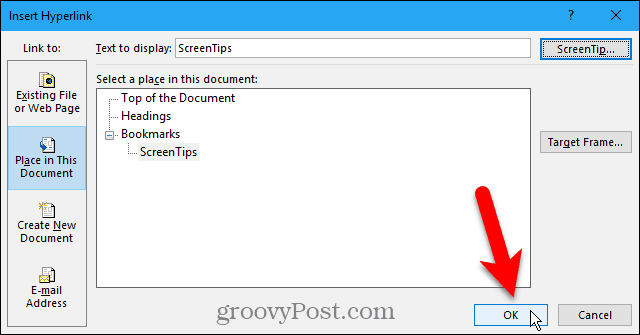 Then, uncheck the Show shortcut keys in ScreenTips box in the Display section. Click OK.
Now you’ll see the keyboard shortcuts in the ScreenTips for buttons on the ribbon (that have shortcuts) when you move your mouse over the buttons. This setting only applies to the ScreenTips that are built into Word. 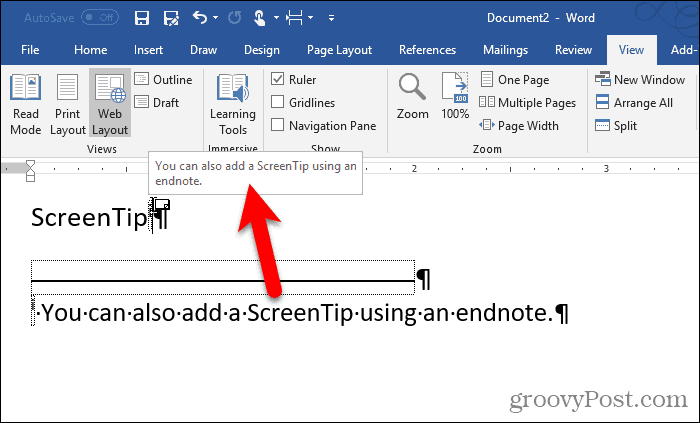 You can create a custom ScreenTip on text or images in your document using a bookmark and a hyperlink or using an endnote. There are advantages and disadvantages to using each method. You can add ScreenTips to both text and images. Word automatically adds a hint about how to follow the link, which is not necessary. You can’t directly edit a ScreenTip. You must open the Insert Hyperlink dialog box. Hyperlinks are automatically formatted with blue text and underlined, so you’ll have to change the formatting if you don’t want the text to look like a hyperlink. You can’t print ScreenTip text. You can easily edit the ScreenTip by editing the endnote. You can print the endnote, which is the ScreenTip text. There are no hints about clicking a hyperlink. You can’t add ScreenTips to images. You must change the formatting of the endnote numeral to hide it if you don’t want it visible in your text. If you don’t want the endnote to print, you must put it on its own page using a page break. Based on the above lists, you can decide which method you want to use. 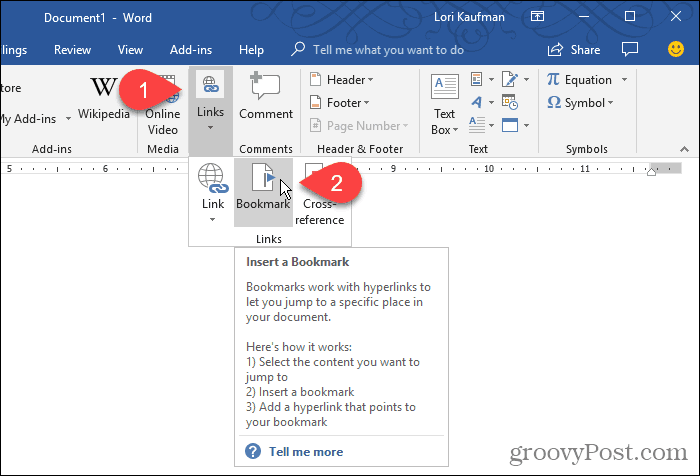 For this method, we’re going to create a bookmark and then create a hyperlink on the same text that goes right back to the bookmark, meaning the link will go nowhere. Click the Insert tab and click Bookmark in the Links section. If your Word window is not wide enough to show the whole Links section, click the Links button and then click Bookmark. When you hover over the Bookmark button, you may see an enhanced ScreenTip, if you left the ScreenTip style on the default setting we discussed in the “Enable and Disable ScreenTIps or Show Enhanced ScreenTips” section above. 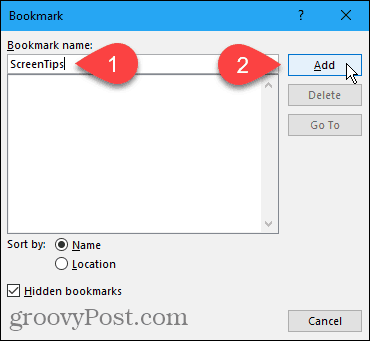 On the Bookmark dialog box, enter a name with no spaces in the Bookmark name box. Click Add. 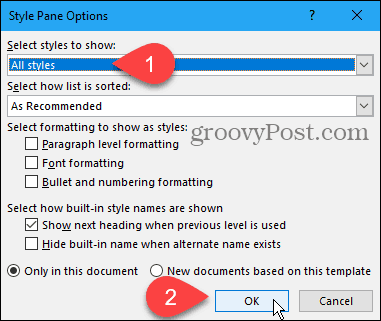 Word adds the bookmark to the selected text and closes the Bookmark dialog box. Now we’re going to add a hyperlink to the bookmarked text. Leave the text selected and press Ctrl + K to open the Insert Hyperlink dialog box. Click Place in This Document in the Link to box and click the bookmark you created under Bookmarks in the Select a place in this document box. If you don’t see your bookmark, click the plus sign to the left of Bookmarks. Type your text for the ScreenTip on the Set Hyperlink ScreenTip dialog box and click OK.
Click OK on the Insert Hyperlink dialog box. When you hover your mouse over the text you applied the ScreenTip to, a popup displays containing your custom text. You can use this method to add a ScreenTip to a normal hyperlink without creating a bookmark to link to first. The ScreenTip contains your custom text and text saying to Ctrl + Click to follow the link. You can’t completely remove the instructions for following the link. But, if you’re creating a normal link, you can change it so you don’t have to press Ctrl when you click the link to follow it. Word formats the text as a typical hyperlink with blue, underlined text. If you want to make the hyperlink look like the rest of the text around it, you can change the formatting. Select the text and use the text color button in the Font section of the Home tab to change the color of the text. Then, click the Underline button to remove the underline. You can also remove the brackets Word places around bookmarked text. Go to File > Options and click Advanced in the left pane on the Word Options dialog box. 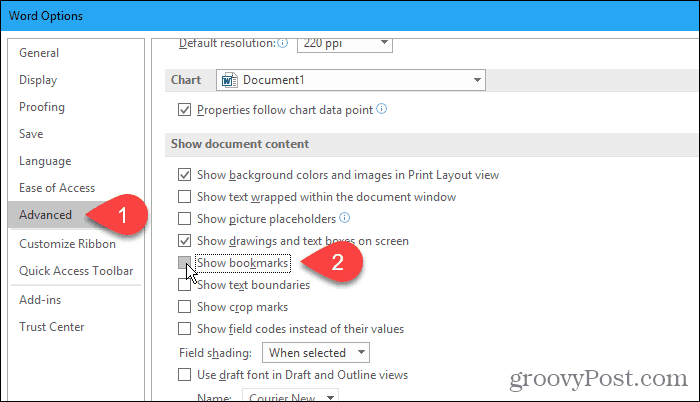 Uncheck the Show bookmarks box in the Show document content section to hide the bookmark brackets. Check the box again to show them. Here’s the text with the custom ScreenTip. 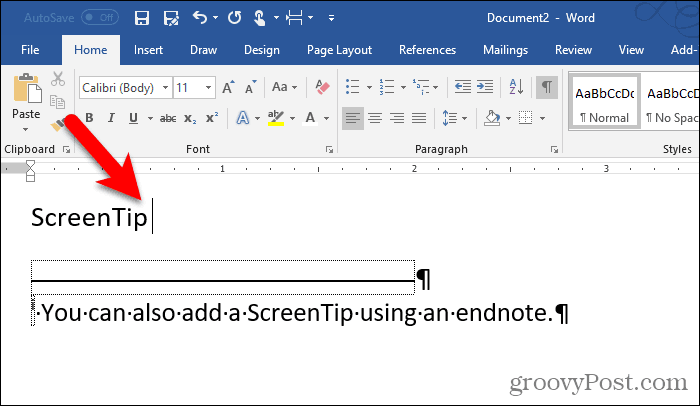 You can also create a custom ScreenTip using an endnote. Put the cursor after the text where you want the ScreenTip to pop up. Then, click the Insert Endnote in the Footnotes section on the References tab. Word adds a small Roman numeral (or lowercase “i”) where the cursor was and puts the cursor in the endnote. 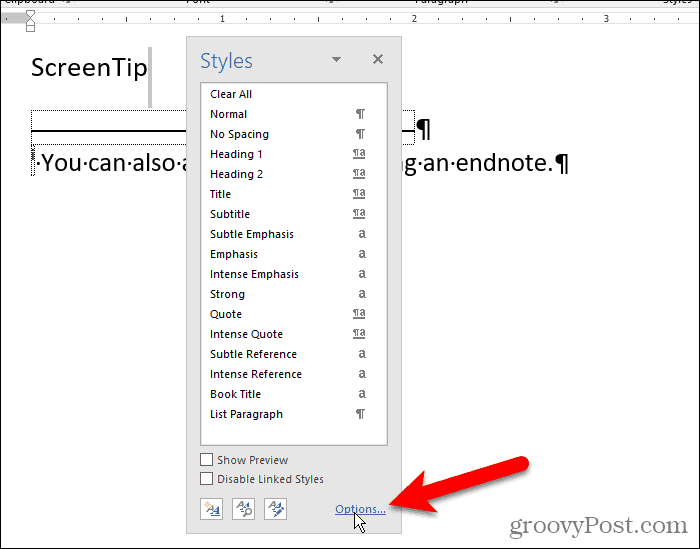 Type the text you want to display on the ScreenTip in the endnote. When you move your mouse over the numeral, your ScreenTip displays. 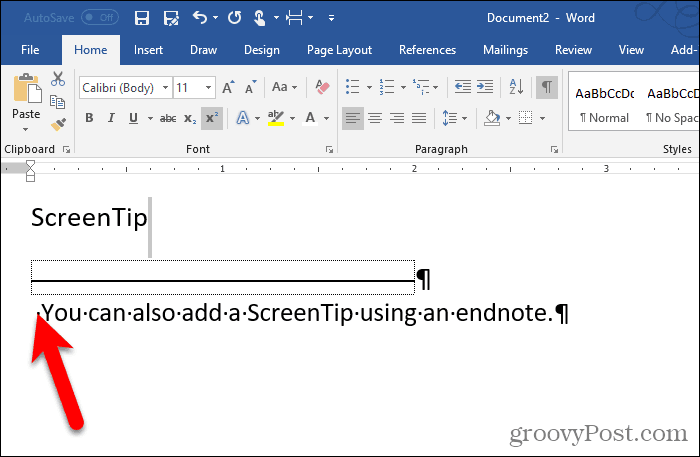 To edit the ScreenTip, double-click the numeral to jump to the endnote and change the text. If you want to hide the numeral in your text, select it and right-click on it. On the mini toolbar, change the color of the numeral to white, or to match the background color in your document. You can also use the text color button in the Font section on the Home tab to change the color. We changed the color of the numeral to white, so it blends in with the background. You can also manually change the numeral on the endnote. Or you can apply the formatting change to the Endnote Reference style and have it applied to all endnote numerals automatically. To change the style, click the Styles button in the Styles section on the Home tab. On the Styles pane, you may not see the Endnote Reference style in the list. If not, click Options at the bottom of the pane. 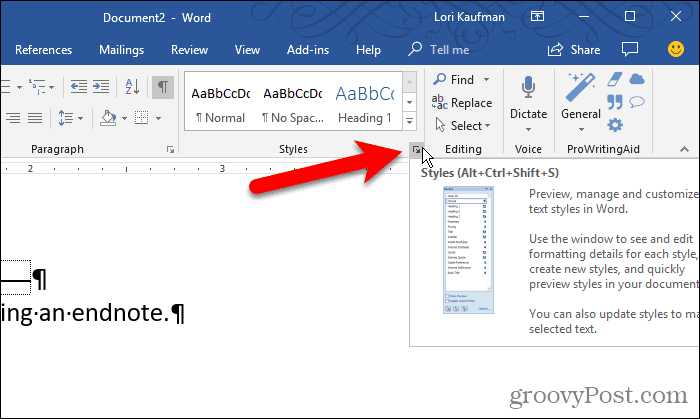 Select All styles from the Select styles to show drop-down list and click OK.
Find the Endnote Reference style in the list on the Styles tab. Move your mouse over the style to reveal the drop-down arrow. 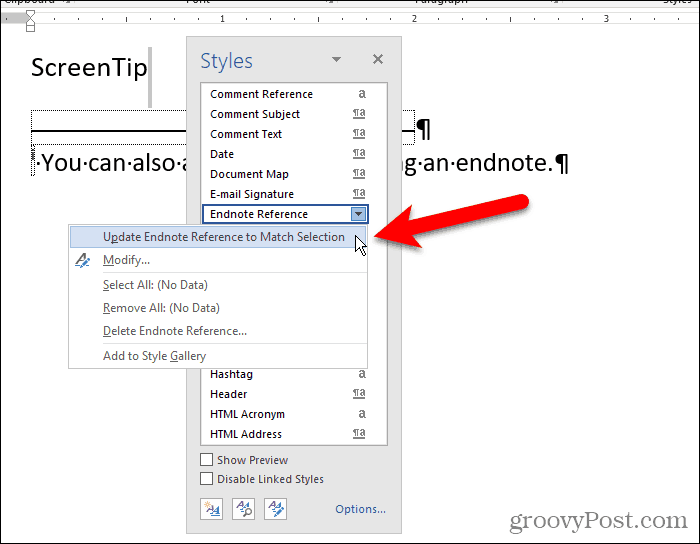 Click the arrow and select Update Endnote Reference to Match Selection. Now the numeral appears hidden in the text and in the endnote. You can “hide” the endnote by putting it on a separate page from the last page of your document. Press Enter after the last line. Then, click Breaks in the Page Setup section of the Page Layout tab. 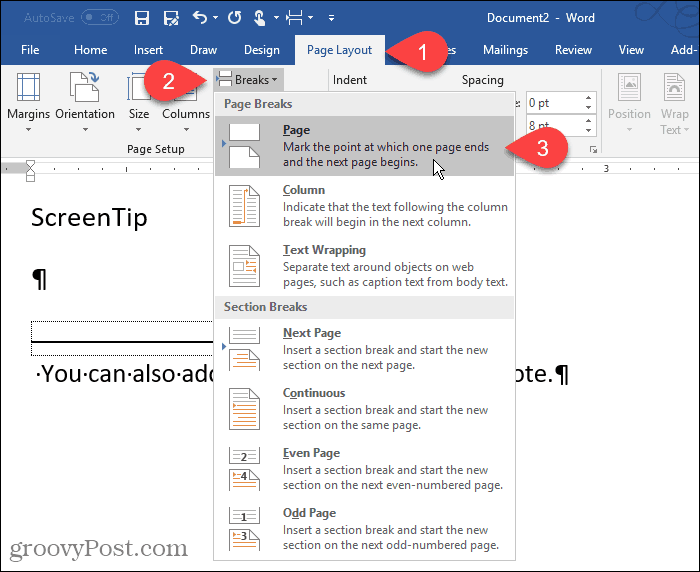 Custom ScreenTips are useful for providing helpful tips to others reading your document without having to add the content to the document itself.